Unfortunately this is our last day in Washington, D.C. We made lots of memories and friends along with some new stories to share back home. Even though this is our last day this most definitely isn't the end. As our last post in D.C we would like to thank EVERYONE who helped all of us get here safe and sound, helped raise funds, and everything in between. 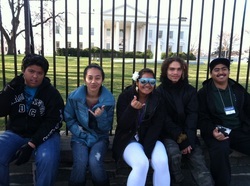 Today we had to wake up uber early to make it to our "special" tour of the White House. Surprisingly, the White House looks much smaller than in movies or pictures. Our tour was very short, but it was very exciting. The rooms we viewed were very regal. 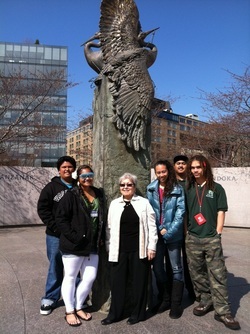 After our tour, we took the Metro to the National Japanese-American Memorial of Patriotism. Doctor Franklin Odo and Betty Taira shared the history and their experiences of World War II. Doctor Odo compared the way Japanese-Americans were viewed during this time to how Muslims were treated after 9/11. Betty told us her experience of being in a concentration camp in Wyoming. She asked us, "If you had one day to move away from your home, what would you pack in one suitcase?" This made us appreciate how lucky we are to live in a place where we don't need to worry about prejudice and racism. 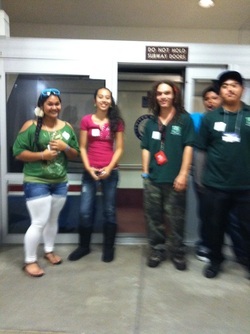 Next we went to the Senate Building to drop our bags off in Senator Akaka's office. 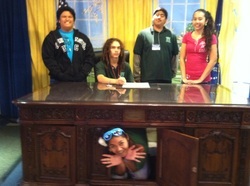 Being there felt like home because of all the reminders of Hawaii (pictures, candy, the local staff). We got a chance to talk story with the Senator for a short while and take a picture with him. He really appreciated the oli and kahiko we did for him yesterday. 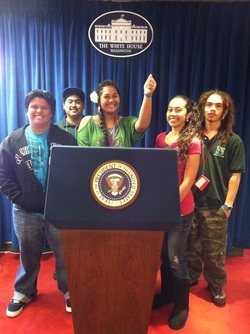 Two of Senator Akaka's staff members then took us on a tour of the Capitol. After viewing a film about the builiding's history, they took us to the rotunda (the very top of the Capitol). There were many paintings and sculptures throughout the whole building. 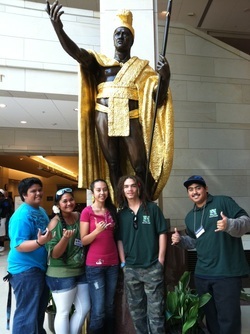 We even saw the statues of King Kamehameha I and Father Damien, representing Hawaii. We also got a chance to sit in at the Senate's Gallery for a few minutes, which was very interesting. This tour was a very special opportunity. We felt extremely lucky to have the chance to participate because it is very rare anybody can partake in these kinds of tours. 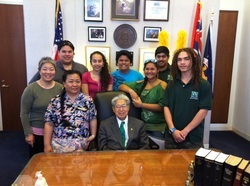 All of us enjoyed Senator Akaka's company and we wish we could come back again to visit. The Farewell Banquet was satisfying, and while we were nervous to perform, everyone LOVED IT. Being from Hawaii, and especially Molokai, has us feeling very proud of where we come from and who we are. We can't wait to get back home, and we will miss our time here in D.C.!! !